To sell an exterior coating, the manufacturer is typically expected to demonstrate the product’s weatherability. This may be mandated by 1) the customer, in bid or procurement specifications, 2) de facto “voluntary consensus” standards (such as AAMA 2604 for a five-year exterior architectural finish), 3) market needs to match or surpass competitive products or 4) the need to provide defensible support for performance or warranty statements. Weatherability test data is not only essential for developing and improving coating products, but for maintaining the quality of a product throughout its lifecycle; however, many businesses cannot wait five, 10 or more years for real-time, field life testing to generate data in multiple climates. In fact, one of the most common questions asked regarding weathering testing is, “How long do I need to test my material?” Then it’s quickly followed by, “But I can’t wait that long. Can’t I do it faster?” Of course, the answer depends on the specific material being tested and where and how long the material is expected to perform in its defined service life. There are essentially two alternatives to real-time testing: 1) outdoor accelerated exposures and 2) laboratory accelerated (artificial) weathering. Here, we address the latter. Watch our resource page for future articles on other testing options. In natural settings, exposures for items such as architectural coatings, automotive coatings and roof coatings may need to be tested for up to 30 years or more to achieve near-complete confidence in the material’s durability in the designated environment. Customers often cannot afford to wait for materials to sit in these conditions without making some earlier assumptions. As expectations for longer product life become more common, new materials need to be evaluated in shorter development cycles in order to bring them to market in a timely fashion; therefore, accelerated testing is driven by economic as well as competitive concerns. Due to the need for more rapid evaluation of materials’ resistance to weathering than can be obtained by outdoor exposure tests, as well as the need for more controlled conditions, test devices with artificial light sources are generally used to reproduce and accelerate the degradation. Laboratory-accelerated weathering device tests are more appropriately referred to as artificial weathering. The acceleration over real-time weathering occurs for several reasons. Principally, the tests can run continuously at naturally occurring or higher irradiance than solar radiation, uninterrupted by the diurnal cycle, seasonal variations and weather conditions. Temperatures, thermal cycles, humidity and water exposure can also be manipulated to maximum, but not unrealistic, stress levels. Specimens can be exposed to spectral energies at or beyond the limits of their intended service exposures, although extreme caution must be exercised so as not to induce unnatural degradation mechanisms. In addition to the ability to manipulate and accelerate weathering conditions on demand, a fundamental benefit of a laboratory test is the precision and repeatability over what is essentially an uncontrolled and variable phenomenon — the actual weather. Plus, each of the weathering factors can be manipulated independently; thus, research can be conducted into the specific response of materials to various weathering factors — experiments which would be difficult or impossible to conduct outdoors. Artificial weathering devices are often categorized by the type of artificial light source used. The most common types are carbon arc, fluorescent, xenon-arc and metal halide light sources. Each has its own inherent benefits (and limitations), of which a weathering experimenter must be aware. Since the radiant energy received by an exposed material is considered the most important, we will focus our attention on the quality of the light source, referring to how well each light source resembles natural sunlight in terms of spectral match. The overarching governing standards for use of these devices, along with practical guidance and cautionary statements, are ISO 4892-1 Plastics — Methods of exposure to laboratory light sources, Part 1: General guidance and ASTM G151-10, Standard Practice for Exposing Nonmetallic Materials in Accelerated Test Devices that Use Laboratory Light Sources. The carbon arc instrument was first used to evaluate the lightfastness of dyed textiles. The first device — the enclosed violet carbon arc — was introduced in 1915 and, later, was largely replaced by the open-flame, Sunshine carbon arc in the 1930s. The spectral emission in the UV bears little resemblance to daylight, as shown by the spectral power distribution graph in Figure 1. Figure 1: Spectral power distribution of enclosed and sunshine carbon arcs compared to Miami sunlight. There is a large amount of historical data using carbon arcs, and some specifications still require their use; however, the technology is generally considered obsolete and has been replaced by full-solar-spectrum xenon arc systems. Linear fluorescent lamps, similar to those used for residential and commercial lighting, have been developed with specific spectral distributions. These sources are incorporated into fluorescent condensation devices (Figure 2). 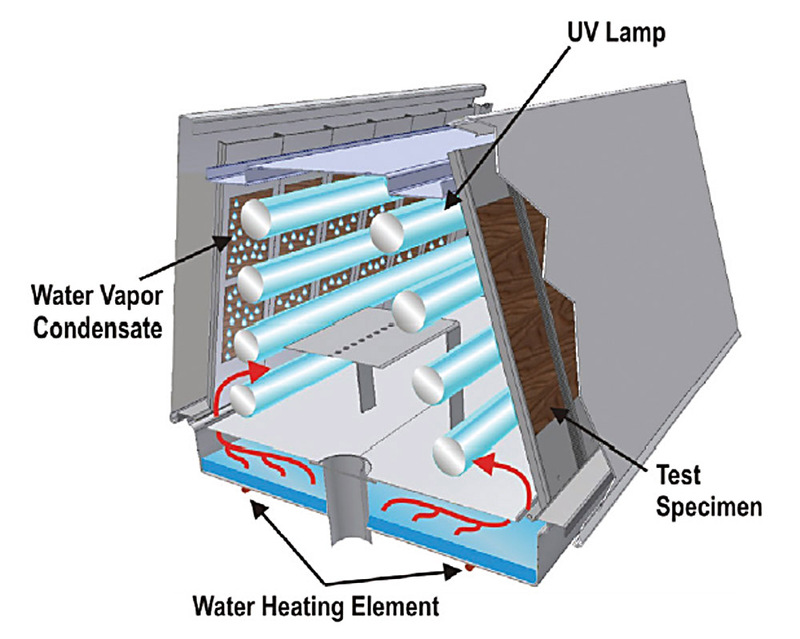 The devices may be used in cycles — light/dark, temperature, condensing humidity and optional water sprays (Figure 2). Their functional design and use are primarily governed by ASTM G154, Practice for Operating Fluorescent Light Apparatus for UV Exposure of Nonmetallic Materials and ISO 4892-3:2013 Plastics — Methods of exposure to laboratory light sources, Part 3: Fluorescent UV lamps. Figure 2: Design of a fluorescent-condensation device. In these devices, a tray of warmed water generates high humidity while the UV sunlamps are on, followed by a dark period of moisture condensation on the cooling test specimens. The intent is to simulate the lower wavelengths of UV solar radiation followed by a condensation period representative of South Florida nights. Two types of UV sunlamps are used. The fluorescent UVB lamps (UVB-313), with a peak around the 313-nm mercury line (Figure 3), has nearly all of its energy concentrated between 280 nm and 360 nm. A large fraction is at wavelengths shorter than those present in terrestrial solar radiation and it has very little energy longer than 360 nm. Reversals in the stability ranking of materials have often been reported between laboratory accelerated and outdoor tests when the accelerated test uses UV-B. This is due to the predominance of short-wavelength UV and the deficiency of long-wavelength UV and visible radiation; the mechanisms of degradation may be significantly different from those of a "natural" test. Both the ISO and ASTM governing standards contain specific notes that their use can initiate aging processes that never occur in end-use environments, and that they should “only be used upon specific agreement” (ISO) and that “use of this lamp is not recommended for sunlight simulation” (ASTM). Nevertheless, they are still in use by some. 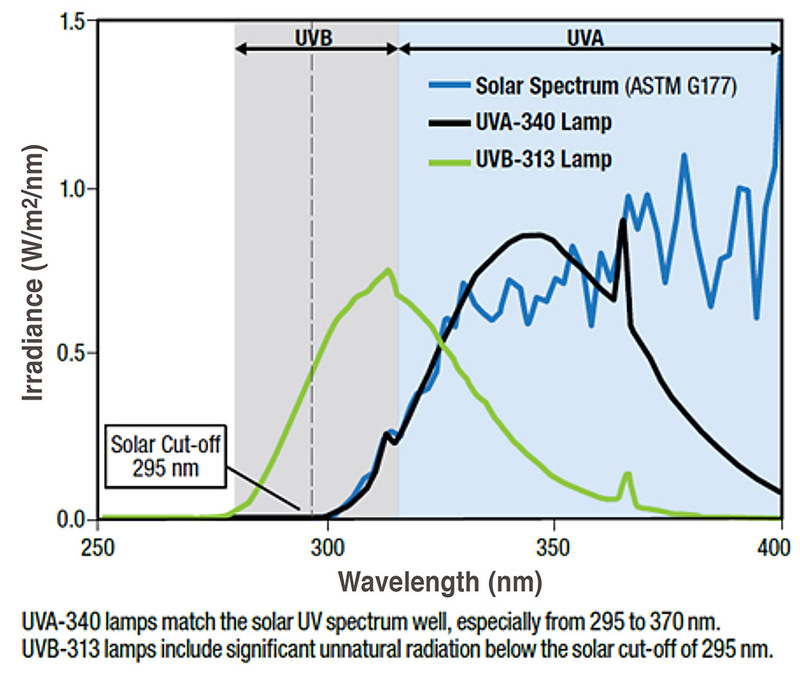 Figure 3: Comparison of UVA and UVB lamps compared to a standard solar spectrum. Fluorescent black light sunlamps referred to as UVA-340 lamps, are available with a peak emission of 340 nm. Developed in 1987, the short-wavelength irradiance simulates that of direct solar radiation below 340 nm but then tapers off to zero in the upper UV region and lacks both visible and infrared wavelengths. Because the UVA lamps do not emit high-energy radiation below the cutoff of terrestrial solar radiation, correlation with outdoor weathering is improved, but test times are longer than with UVB lamps; however, high-test acceleration that lacks good correlation is of no value. In general, these devices provide irradiance control, water condensation (with optional water sprays) and cycling (using a cooler lights-off period) for dew simulation. The test surface is exposed to a heated, saturated mixture of air and water vapor (relative humidity approaches 100 percent during the dark cycle) while the reverse side of the panel is exposed to room air, which causes the panel temperature to drop below the dew point. This causes water droplets (dew) to form on the exposed surface. The sequence and time intervals for both the ultraviolet cycle and the condensation cycle are programmable and automatic. Likewise, temperatures can be controlled (within limits) during both the UV and condensation cycles. Fluorescent-condensation devices, as they are known, provide a good simulation of the lower half of the solar UV spectrum (with UVA-340 lamps) but lack the longer UV as well visible wavelengths responsible for some photochemical degradation processes. The lack of near-IR wavelengths means that, unlike in outdoor exposures, all test specimens will be at the same temperature. This can lead to differences in correlation to outdoors due to, for example, the difference in temperature effects on specimen moisture or thermally driven degradation chemistry. In particular, many colorants are sensitive to these missing wavelengths. Fluorescent-condensation devices were primarily designed and best used as screening tools for coating binder UV and hydrolysis degradation screening, not as general predictive tools for coating weathering performance. The simulation and natural balance of the three key weathering stresses (heat, sunlight, moisture), as well as their cycles, is very limited with this technology; however, the devices can prove very effective as research tools when properly used and understood. Xenon arc gas discharge lamps were the next development, replacing carbon arcs. The first weathering instrument using a xenon-arc lamp was developed in 1954 in Germany. In use in North America since 1958, the lamp, when properly filtered, more closely simulates full spectrum solar radiation than any other artificial light source. Today, xenon lamps are the gold standard for solar simulators. Unlike the electrically burning open carbon arcs, the xenon arc is a precision gas discharge lamp in a sealed quartz envelope. The spectral power distribution can be finely tailored through optical filtering to simulate solar radiation, ranging from above-the-atmosphere through to sunlight-as-filtered-through-window-glass. As such, it is universally preferred as a light source when the material to be tested will be exposed to natural sunlight. In the course of xenon device evolution, two geometries and xenon lamp systems have evolved. 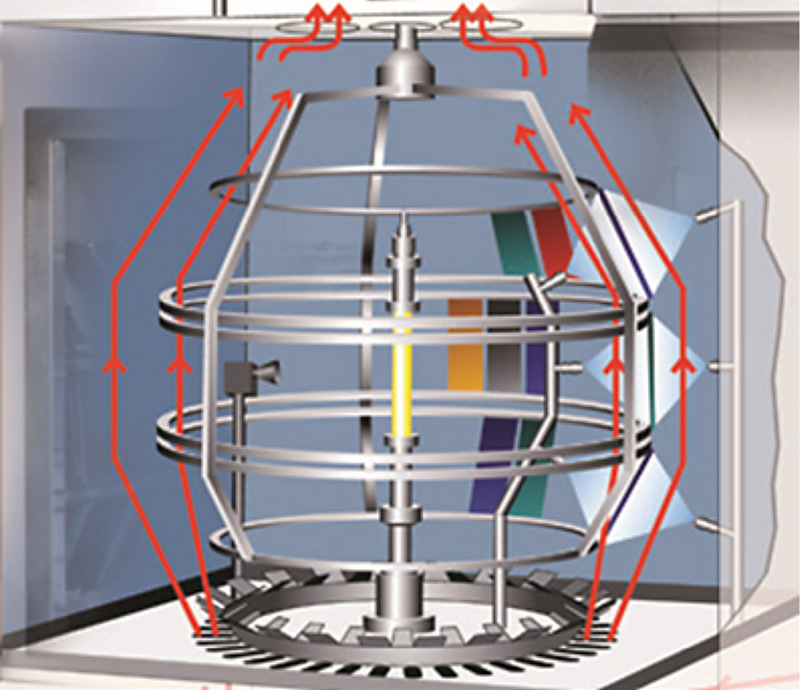 The geometries are described as “rotating rack” (Figure 4) and “flatbed.” In the former, relatively flat test panels are placed on a rotating carousel rack with the lamp in the center. This provides the maximum in exposure uniformity to the main stress factors of heat, light and moisture. Less expensive flatbed units use one to three lamps, located in the ceiling of the chamber. Due to fixed conditions, such as lamp irradiance overlap and airflow, these devices are as uniform or consistent as more expensive rotating rack instruments, even though they may meet the same test standards. The other differentiator is the lamp cooling method. Although it really doesn’t affect the delivery of the weathering stresses, and applies only to rotating rack designs, forced air cooling is used for lower sample capacity devices and water cooling for high capacity units due to the higher lamp power required. In any event, equipment manufacturers offer a variety of optical filter systems to simulate outdoor daylight (Figure 5). There are spectral differences among them — even if the systems meet test standard requirements — that may result in differences between tests using different manufacturers and models. ASTM G155, Practice for Operating Xenon Arc Light Apparatus for Exposure of Nonmetallic Materialsand ISO 4892-2 Plastics — Methods of exposure to laboratory light sources, Part 2: Xenon-arc lamps and methods referencing themare the primary standards regarding performance requirements of these instruments. Figure 4: Typical rotating rack xenon arc weathering device geometry. Xenon arc exposures have become the standard artificial weathering test method for both performance and appearance properties; however, the choice of test method and parameters will affect the result. 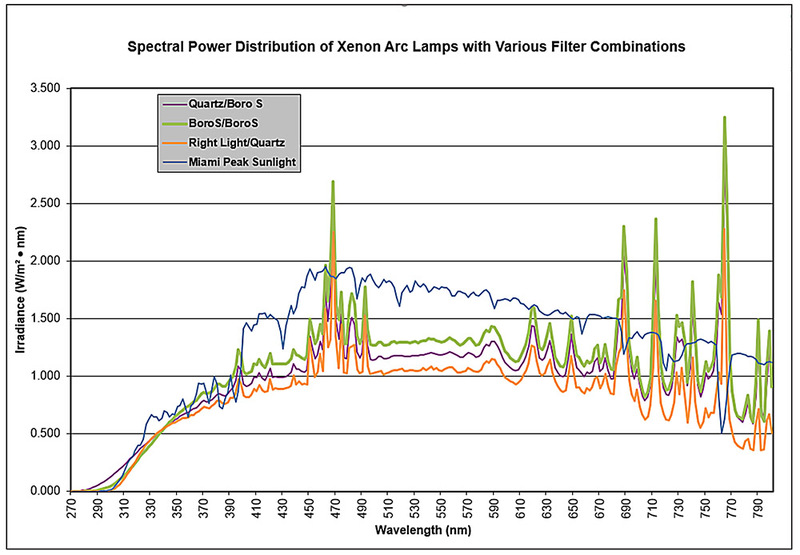 Figure 5: Example spectra provided by different xenon lamp filters versus Miami peak sunlight. Note that irradiance levels can be varied in most devices. Corrosion testing of coatings and substrates is often considered a topic separate from weathering; however, coatings weather from the effects of the environment, and substrate corrosion is just a manifestation of that. By far, the most widely used corrosion test methods are ISO 9227, Corrosion tests in artificial atmospheres — Salt spray tests and ASTM B117, Standard Practice for Operating Salt Spray (Fog) Apparatus, often referred to as the neutral salt spray (NSS) or ”salt fog” test. This consists of exposure of test panels to a 5-percent, sodium-chloride (salt) saturated fog at elevated temperature. It can be an aggressive test; however, there is substantial disagreement over the relevance and correlation of the test with any real-world results, as well as relating the test time to outdoors. One factor may be that the steady state conditions used in the test never occur outdoors. Several improved, basic wet-dry test cycles have been introduced over the years, offering improved correlation for some coatings. These cyclic corrosion tests (CCT) have now expanded to a variety of fairly complete cycles involving alternate electrolytes, complex temperature and wet/drycycles (some involving refrigeration), solution sprays, ramps and holds. Most of these have been pioneered by the global automotive industry. Unfortunately, it is not currently possible to combine classical weathering testing involving solar radiation with corrosion test exposure to dilute salt atmosphere at the same time. However, ASTM D5894-10, Standard Practice for Cyclic Salt Fog/UV Exposure of Painted Metal, (Alternating Exposures in a Fog/Dry Cabinet and a UV/Condensation Cabinet) does alternate between the exposures; some coatings tests use the concept to alternate between a salt spray (fog) and xenon arc weathering. It is important to note that no artificial test can ever precisely duplicate outdoor exposure conditions. Since outdoor exposure conditions can and do vary greatly on both short-term, seasonal and long-term cycles, the use of laboratory artificial weathering devices, such as xenon arc, are primarily for the controllable, repeatable and reproducible conditions that the technique provides on a comparative basis. Any acceleration over real-time weathering should be considered a bonus rather than the primary reason for implementation, although we recognize that this is not usually the case. It must be recognized that standardized test methods have limitations. First, most test methods are universal one-size-fits-all methods that do not factor in specific material. Second, they rarely represent — and may not predict — performance in any specific climate. Just as an automobile user manual details the operation of the vehicle but contains no driving instructions, standards may specify conditions but not how long to run a test or how to interpret the results or relate them to outdoor exposures. This requires much skill and experience as well as specific correlation and acceleration data. Most standard weathering test methods have remained unchanged for decades, despite advances both in equipment technology and in our knowledge of weathering testing — especially for coatings. A relatively new xenon arc test method, ASTM D7869-13, Standard Practice for Xenon Arc Exposure Test with Enhanced Light and Water Exposure for Transportation Coatings is the result of over 20 years of research and 10 years of coordinated effort by a consortium of companies involved in automotive and aerospace coatings. In short, the new test method was able to achieve vastly improved test correlation to benchmark South Florida exposures, validated with approximately 25 different monocoat and basecoat/clearcoat automotive and aerospace paint systems, and achieve a 40 percent greater test acceleration over the previously used standard xenon method. Although the new methodology has yet to be extensively evaluated for other paint and coating technologies, the science-based methodology, which is more realistic in terms of weathering stress delivery, is likely to be adopted more broadly in the accelerated laboratory weathering testing of paints and coatings. A variety of weathering testing techniques is available to the coating formulator, resin and additives development researcher and end user. Real-time exposures in end-use and/or benchmark locations are still necessary; however, the use of accelerated weathering techniques is a practical necessity. The pace of development of new and improved accelerated techniques has quickened, and the industry is benefitting from better and faster tests. It must be recognized, though, that standards development and specification modernization are historically slow processes, and the best available techniques may not be included for a decade or more. Although it may have taken over 100 years of weathering tests, we now have greater confidence in our approach to the accelerated weathering testing of coatings, and this is likely to grow in the foreseeable future. *Claims or positions expressed by sponsoring authors do not necessarily reflect the views of TPC, DurabilityandDesign.com or its editors. Joining Atlas in 1995, Zielnik provides customer support as a senior weathering scientific consultant. 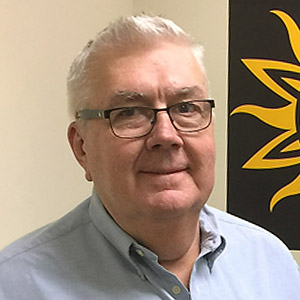 He also serves as global applications manager at Atlas, developing new applications and testing methodologies as well as verifying instrument performance to global test standards. Further, he acts as product manager for corrosion and flammability testing Instruments.